We reconvened at John’s house this morning with a brand new crew. 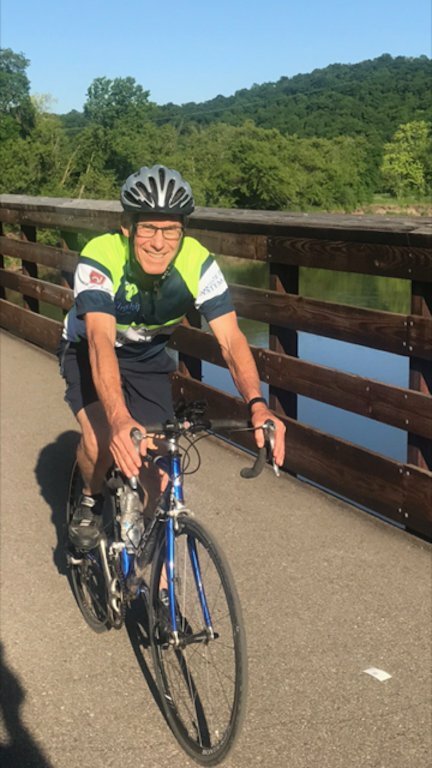 Most joining John and Dennis are returning riders on the CEM, including Joy, Johnny, and Jim; however, we also have a rookie, Brian Wester, our first ever Merchants Bank employee. Welcome to the ride, newbie! Hazing begins in a few hours. Jay is returning again as our support driver, and Sherry is riding along for the first time ever to provide emotional support and to see how things really work on the CEM. Or she is along to shop in scenic downtown Lanesboro while we are on our daily rides! We made the drive to the southern part of Minnesota for our final three days on the Root River Trail, arriving on the west end of the trail in Fountain by late morning. Jim, John, Joy, Johnny and Brian readied themselves for the first trip of the day; Dennis agreed to take a turn at the wheel of the RV to take it ahead to Lanesboro with Jay to find a campground. John made the suggestion, stating that Dennis had probably accumulated enough miles in the first six days. Dennis suspected it may have had more to do with John learning that this was a nice downhill ride from Fountain to Lanesboro. Regardless of the true motivation, we agreed on the plan. 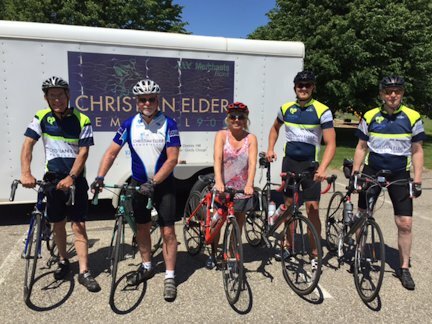 The riders had a perfect 12-mile ride to Lanesboro, where they located the city campground along the river and stopped for a not-so-quick sandwich lunch. Johnny was more interested in fueling up on his mom’s poppyseed bread and his wife’s oatmeal cookies, which are delicious, by the way. Oh to be young! We finally got back on the trail by 1:30, riding back toward Fountain, but turning south on the Harmony-Preston Trail at the 5-mile mark. The first 12 or so miles of this trail are very pretty, crossing numerous bridges over branches of the Root River and over several creeks. Along the way, we spotted a couple of fly fishermen wading through one of the creeks, casting as they walked. After the scenic portion of the trail, we hit a steep climb up to a plateau and several rolling climbs through farmland on our way into Harmony. Before reaching Harmony, Brian’s bike malfunctioned such that he could no longer shift the front sprocket to the “granny gear” level. We reassured him that he wouldn’t need it for the mostly downhill run back to Lanesboro, and he seemed happy with that. 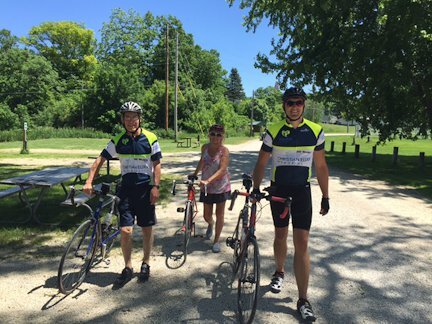 We reversed our course back to Lanesboro, Johnny and Dennis turning back toward Fountain for some added miles on a steady climb to the west. 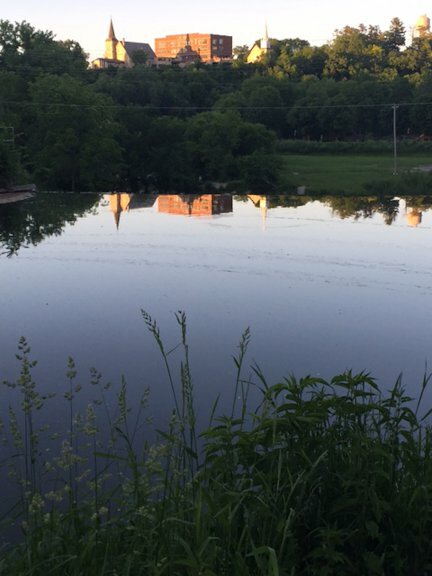 Eventually we all made our way back to our campground in Lanesboro, well into the evening. These travel days always go later with such late starts. We knew we were getting a great payoff, however, as Jay was grilling rack upon rack of baby back ribs for us. The ribs were outstanding as always. After dinner, John brought out Sherry’s rhubarb pie (finally!) and served it with a couple of scoops of DQ ice cream. Legs 1 and 2 riders, you are really missing out! The RV and camper are backed up within feet of the river just above the dam. We literally have the campground to ourselves, and the quiet serenity and the white noise of the river rolling over the dam was luring everyone away to their beds one by one, and not one of us managed to stay awake past 9:30.